Their hands were small, frail and delicate, their skin so soft, satiny and supple. 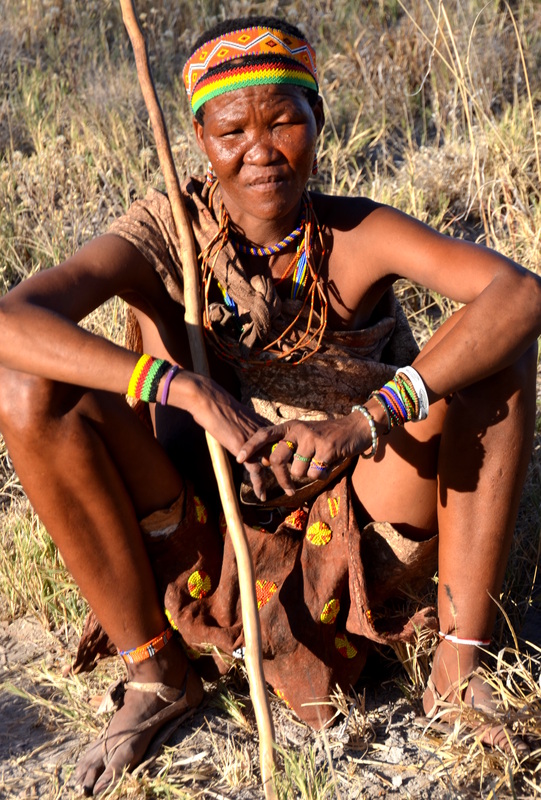 “We eat and drink the fruits and vegetables of the desert,” the San Bushmen ladies explained as to why their skin is so soft even though the live in the dry hot Kalahari Desert. The ladies and men stood around 4 1/2 feet tall and graciously and happily welcomed us to their homeland in their click language. Some women were bare breasted, one carried a child on her back and several appeared much older. They were dressed in soft animal skins and their skirts were adorned with large polka dots of multi-colored beads to cover the holes that appeared over the years in the skins. A shawl of animal skin was draped across one shoulder, leaving one breast uncovered. Their shoes were handmade sandals from animal skins. And their hairdos where short with many twisted stands of hair standing straight up. 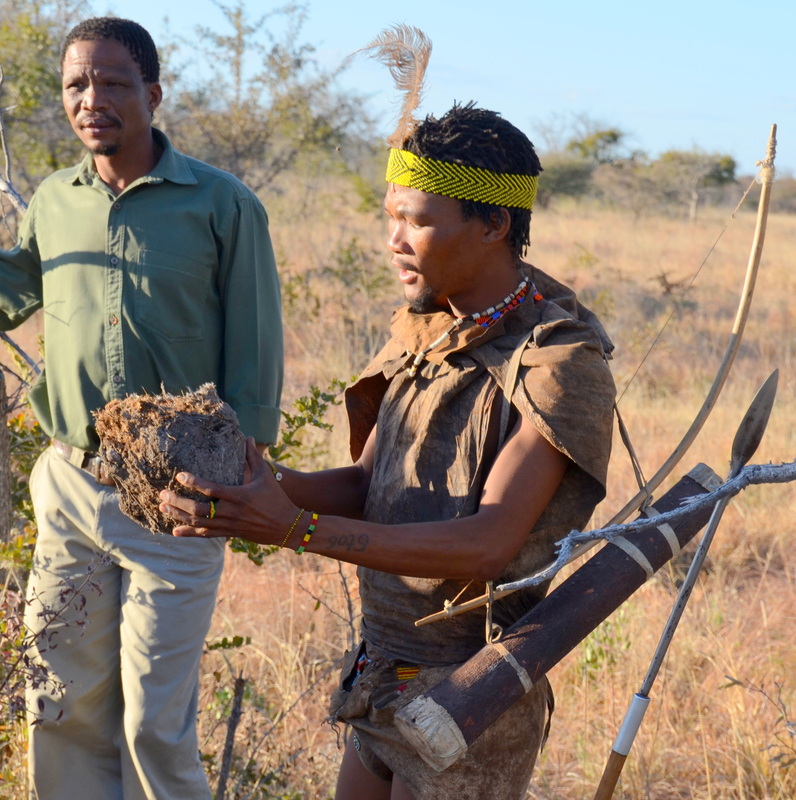 More and more San bushmen kept coming from the bush walking toward us single file on their path to where we were waiting until there were 12. 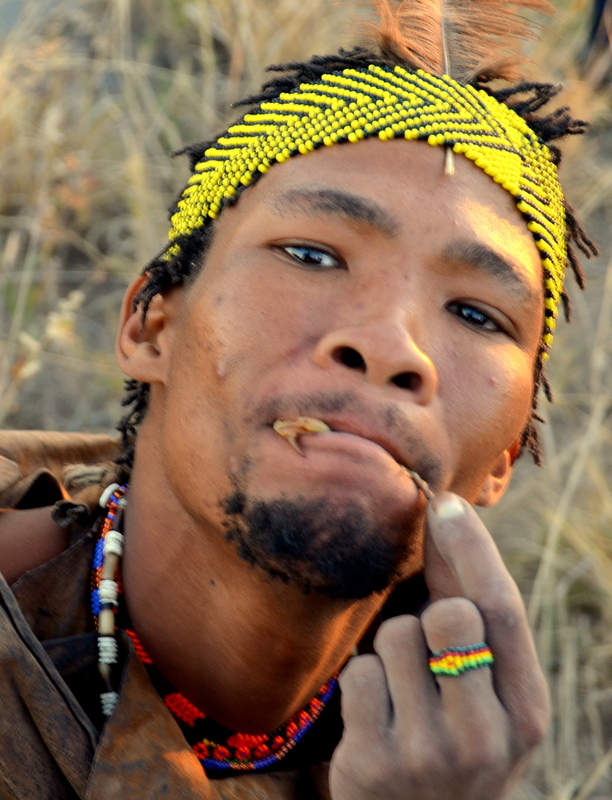 These were the San Bushman from whom all mankind originated over 30,000 years ago, also called First People. 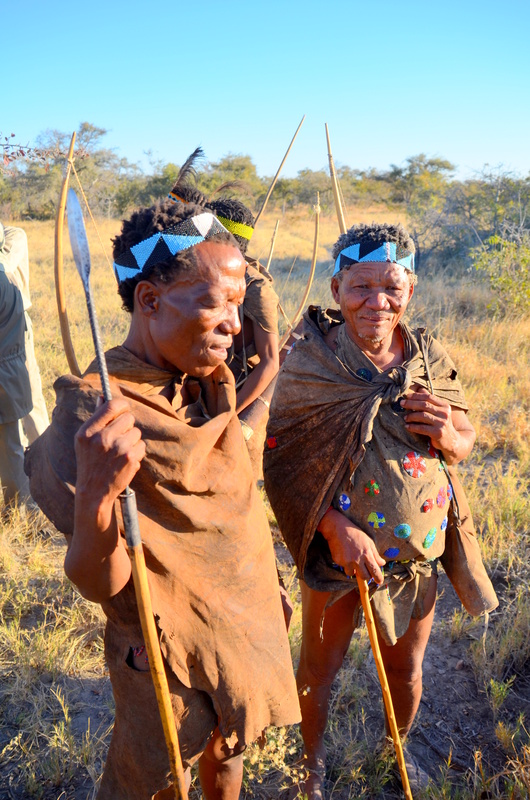 The men wore animal skins to cover their private parts, plus they carried arrows and bows for hunting for wild animals. 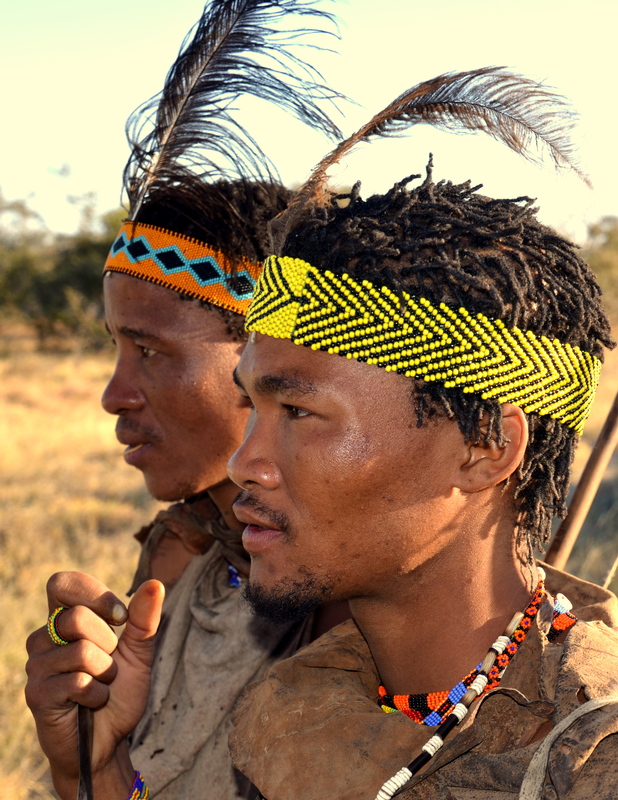 Today, San Bushman are the only people who can run full speed and “talk” at the same time and they speak/sing the old San dialect. 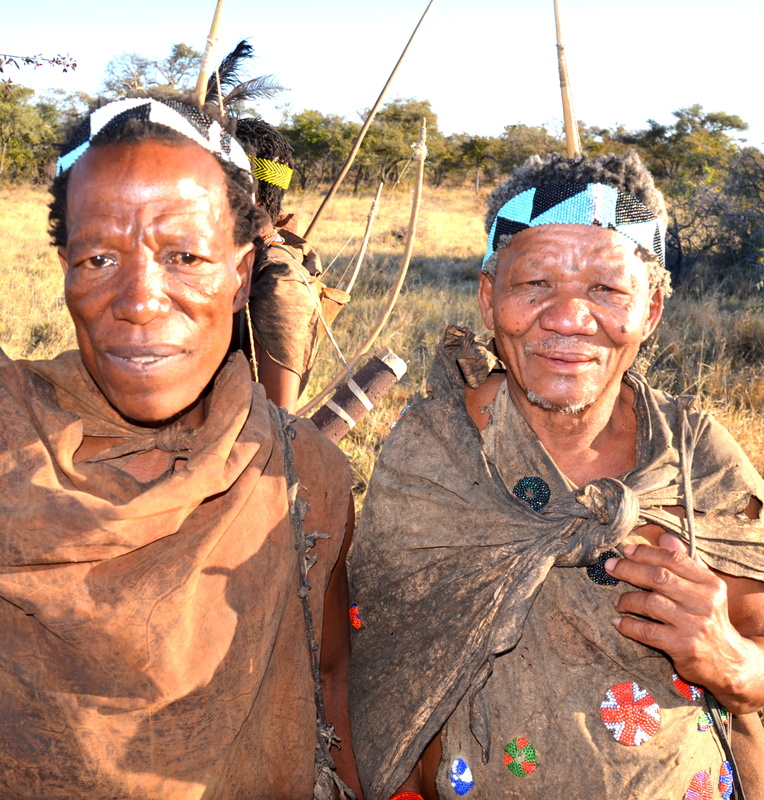 We were visiting with the Zunchwazi clan in the Kalahari Desert on a Tauck World Discovery tour. 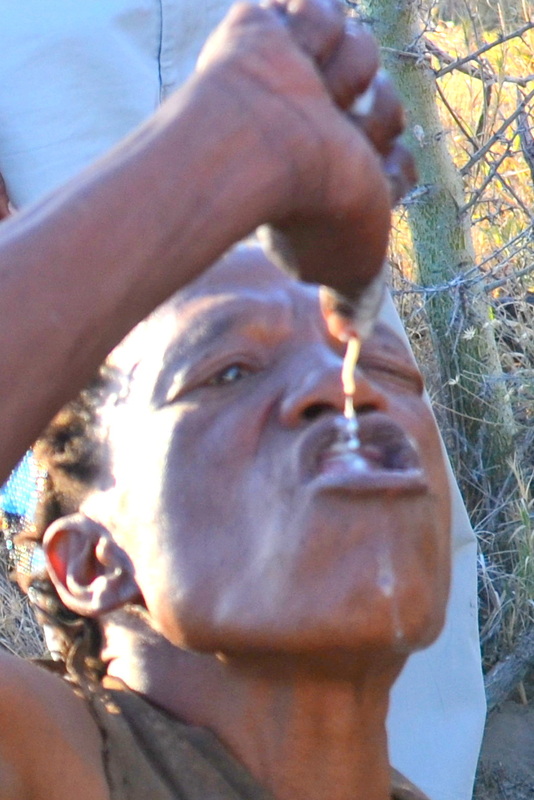 The San Bushmen now have to live in the Caecae village in Botswana because the government has leased their land for diamond and oil mining. 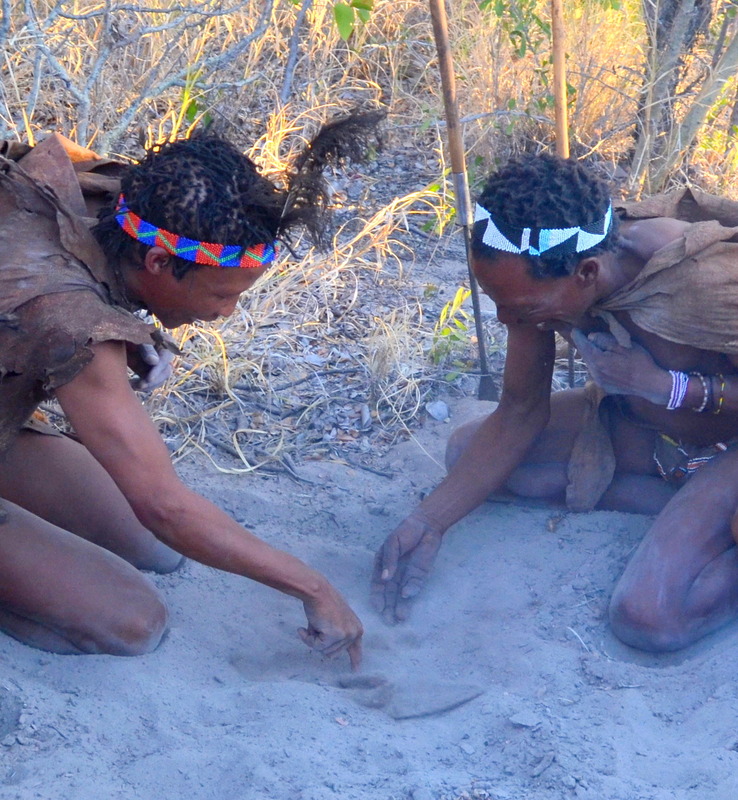 And now they must obtain their food from farming in the new village, not their homeland in the Kalahari Desert. Each clan “sings” a different click language in notes because their talking is singing. They communicate by notes, 4 click sounds and 5 tones. TC is a pop made with the tongue on the lips outside of teeth, C is also a pop made by bending the tongue by the teeth, X is a fast clicking made by the tongue and the roof of the mouth, and Q is a pop. They sing songs about giraffes, eland, and porcupines. 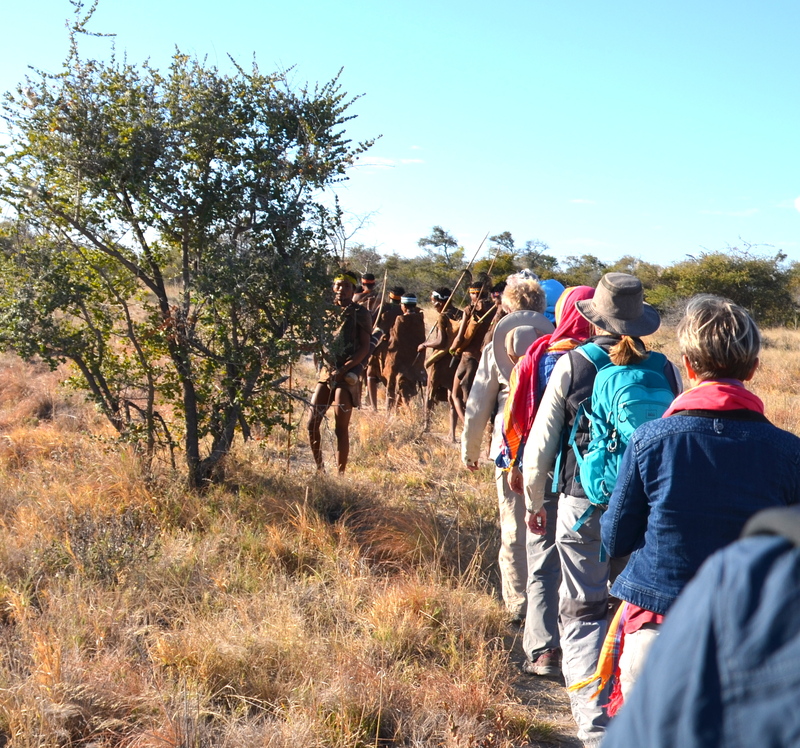 Now it was time to follow the San Bushmen further into the Kalahari where the young leader of the group, with an interpreter who spoke English and their click language, told us about the advantages of elephant poop. And we were all laughing so hard as he spoke using his mime antics. When we didn’t totally understand his actions, the interpreter helped us understand. He told us elephant poop helps arthritis, sleep, cuts which are rubbed with burned poop ashes, keeping mosquitoes away by burning it, and chicken pox by using the liquid from it. 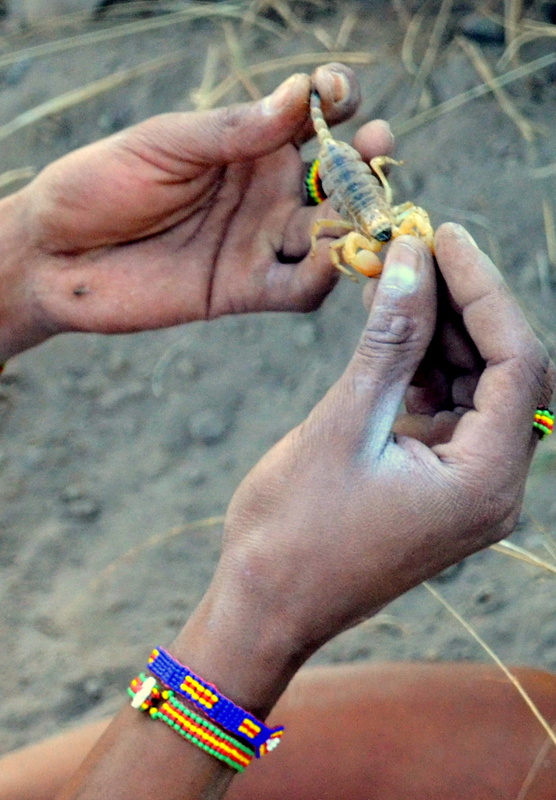 Next we saw how the First People find scorpions in the desert dirt and then eat them. Scorpions, they said, have a lot of protein. 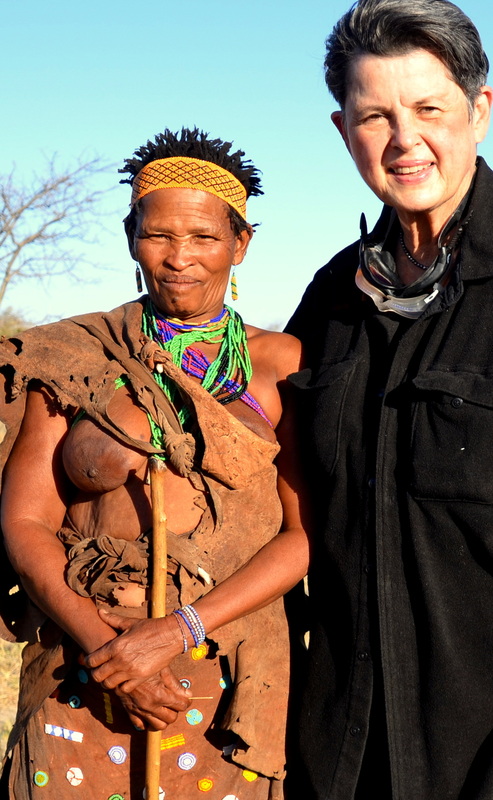 Living nomadic lives, San Bushmen eat bush berries, raisins, bulbs, corms (garlic like family), geophytes, cucumber, nuts from morama plant, bulbs, and medicinal plants and more, all collected by the women. 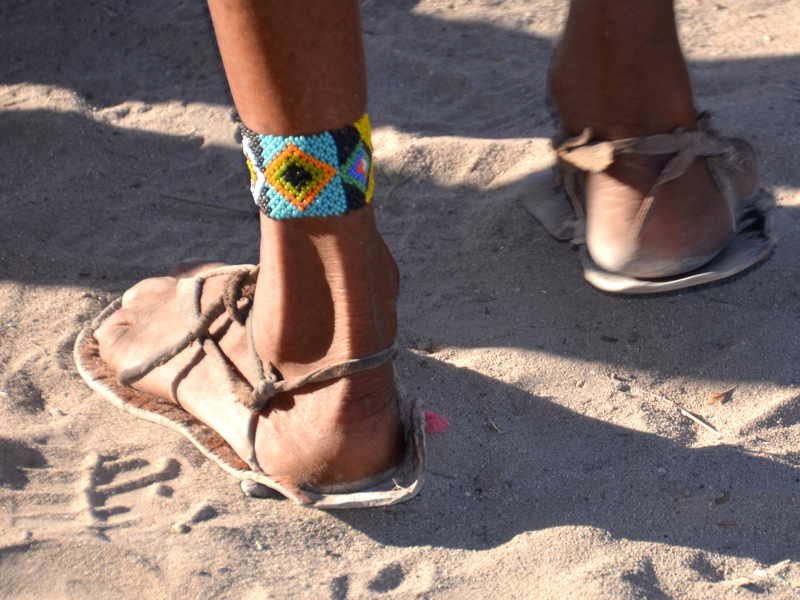 As the young San Bushman was showing us how they live in the desert, we noticed a tattoo on his arm and he explained it indicated he had ran for 24 hours non-stop. 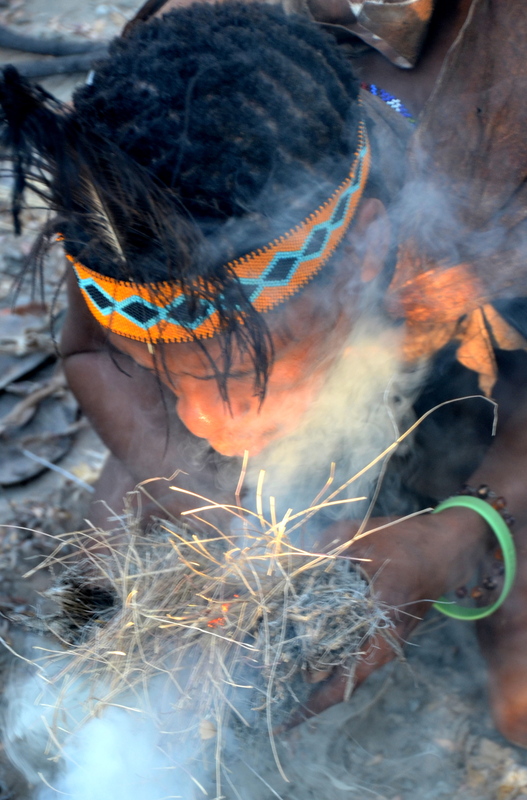 Controlling their appetite was natural for the San Bushmen on long hunting trips. And they did it by eating the meat of the hoodia gordonii plant, found growing in South Africa and Namibia. 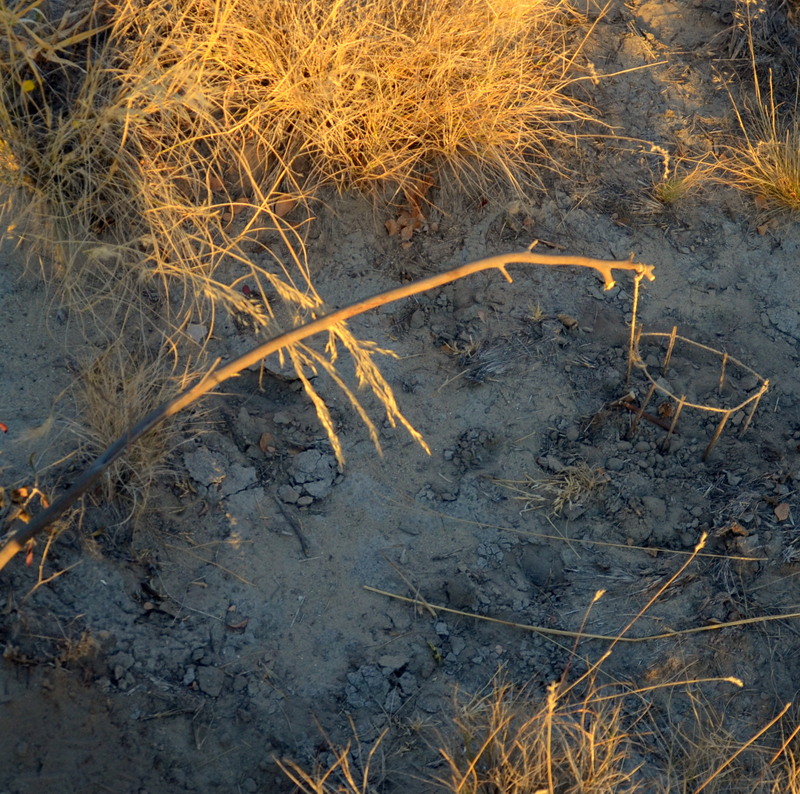 The leafless spiny succulent plant was also used for indigestion and small infections. So in 1977, the South African Council for Scientific and Industrial Research isolated the ingredient in Hoodia –now called P57-which is the appetite suppressant. It was patented in 1996. 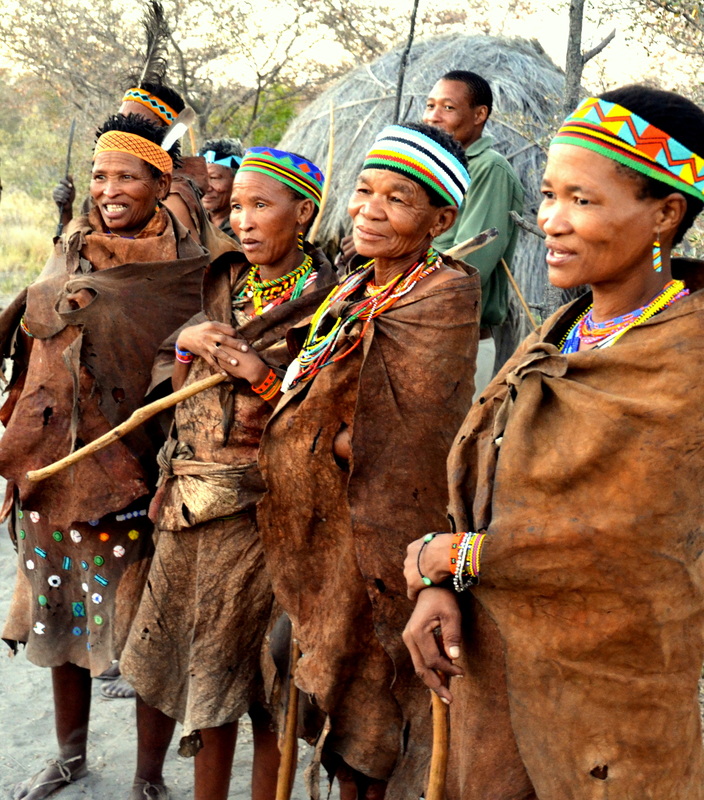 In 2002, the San Bushmen’s rights to Hoodia were officially recognized allowing them a percentage of the profits and any spin-off from the marketing of it should it ever occur. 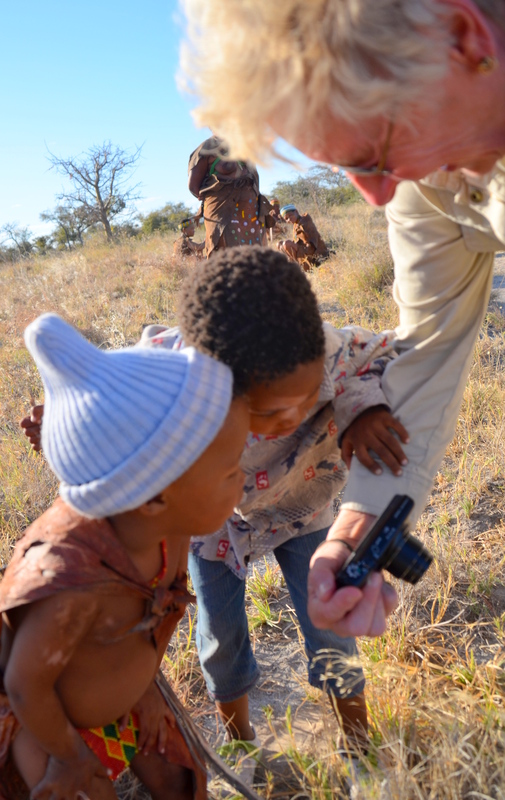 As the San Bushmen were showing us how they make a fire from rubbing two sticks together, we also just had to take photos of their precious children and, like all children, they posed and had to see themselves in the photos. 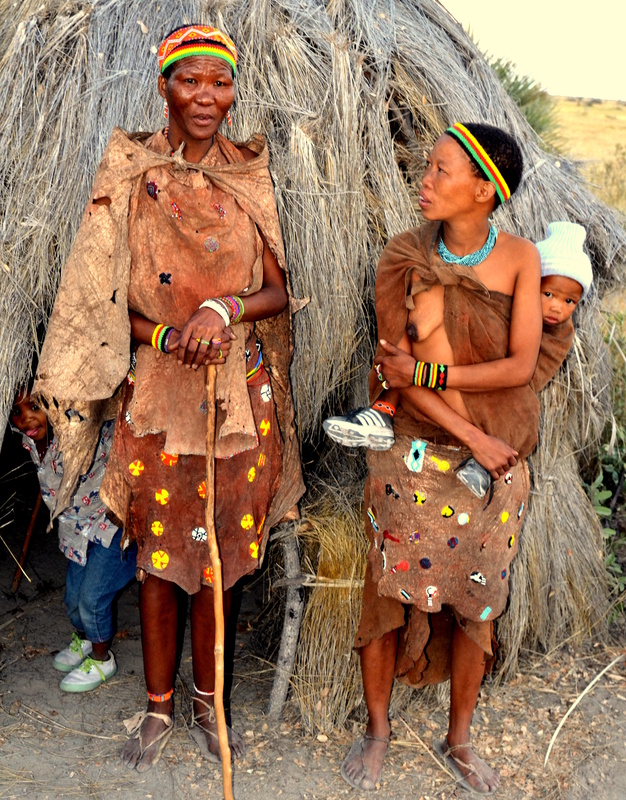 The San Bushmen are noted for their love of children. Now the fire was beginning and a big fire was going as all gathered in a circle to sing, clap, laugh, smoke a cigar and play Paper, Rocket, Scissors, 1,2,3. It was amazing to watch them in their intense competition. we came upon Cobra, and old man with dread locks and western clothes, puffing on his hand-rolled cigarette. Cobra, their healer and problem solver, smokes his hand-rolled cigarette. Our guide them showed us how they make traps to catch small animals for their food, and explained that they move to another place in the desert when they cannot find food. And they moved frequently. But the First People moved to one place they do not like. 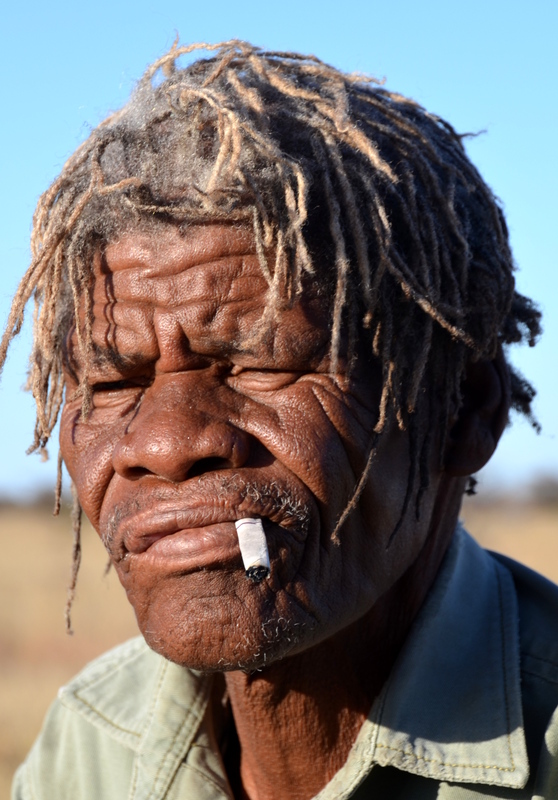 Between 1950-90, they were moved from their native indigenous land in the Kalahari Desert by the government of Botswana and they had to switch to farming as a result of the government mandated modernization programs. 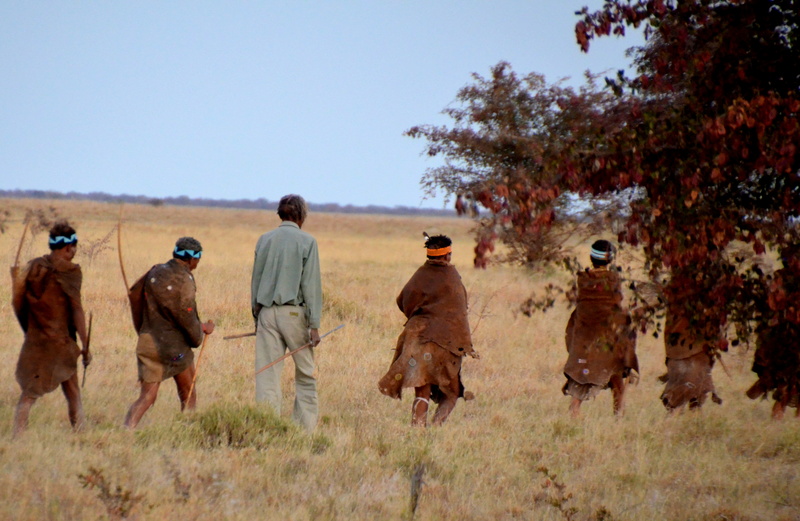 To hunt on their land today, they have to apply for restrictive permits in the Central Kalahari Game Reserve, their homeland for more than 30,000 years, which has been leased for diamond mining and oil fracking. 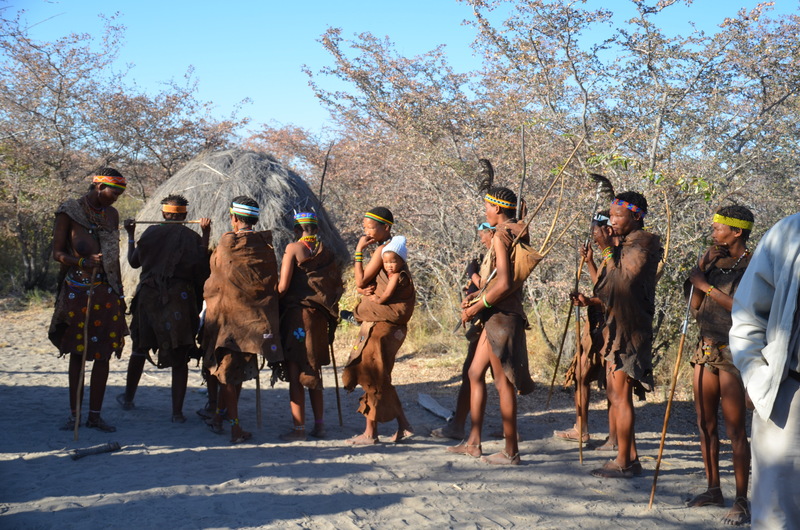 The lessons of survival in the Kalahari Desert were over now and after posing for photos with us, the 12 San Bushmen walked down their worn path to their Caecae village where they must live another life they do not want. And all that wealth of knowledge learned from the Kalahari in anthropology, genetics, medicines, food and water is no longer needed.